We’re right at the height of football season and that’s an exciting time for a lot of people. In New York and New Jersey, they’re excited about this year’s draft picks. In Pennsylvania, they’re still basking in a Super Bowl championship while New England wants to get back there. Some fans are following the college game, while high school and youth football are popular in many areas of the northeast. 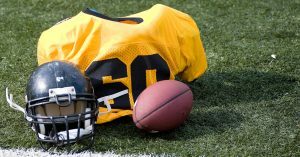 If you’re involved in running a youth football program, you know it can be a lot of work and a big part of the job is taking care of equipment. Football teams have large rosters and a lot of equipment and if you need extra space for storage, A.B. Richards can help. Storing football equipment isn’t your only consideration. During the season, you’re going to need access to that equipment for practices and games. A.B. Richards makes that easy. We’ll bring your storage container right to your athletic facility or wherever it’s needed. We’ll bring you a sturdy and secure storage unit, which is made of 14-gauge steel. The doors to your unit will swing open for easy access to your equipment. A.B. Richards can give you a place to store your equipment and we also want to give you tips on how to store them. The first and most essential step towards storing football equipment is cleaning. You want to wash pads and uniforms regularly to rid them of bacteria and odor, according to LiveStrong. Wash the pads, once or twice a week, setting the pads out in the sun to dry. If the pads are built into the football pants, hang the pants over a clothesline or over the back of a chair. Be sure to remove the belt. Pants with belts and pads sewn in need to be washed as one, while pants with removable parts should have the components washed separately. You also need to avoid mold, so let everything dry out after each practice. Shoulder pads should be set on the ground to let dry. You can wipe dirt off the shoulder pads with a dampened rag. Then take a dry rag to dry them. If there’s trouble removing some dirt, use athletic disinfectant. Take all of your pads to be professionally cleaned when the season ends. According to USA Football, you should be careful about using commercial cleaners on a football helmet. These products can damage the helmet shell or liner. The best way to clean helmets is by using good old soap, water, and disinfectant. Some helmets have removable over liners that can be cleaned. Always air dry them. When it comes to off-season or between game storage, USA Football recommends not stacking the equipment. It works better if you can shelve your equipment. Keep your storage area dry with plenty of air circulation. A.B. Richards will make your equipment storage easy and we’re available in many areas throughout the northeast, including New York, New Jersey, Connecticut, and Pennsylvania. We won’t let you get sacked by a storage problem! Contact us today.